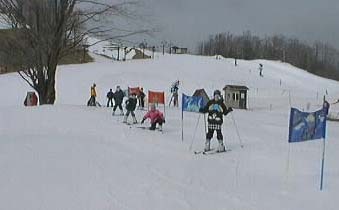 Every year, well behaved Onekama Students come to Crystal Mountain to take advantage of the Michigan's ski season. Today the First, Fourth and Fifth enjoyed the snow! Thank you Crystal Mountain Workers! 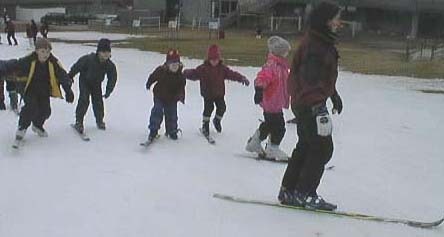 In the beginning, the first graders worked to ski on one ski. They were doing quite well following their leader. Miss Kulhanek and her two students had a great time.. The fifth grade class had a great time at Crystal Mountain. "I was afraid I would get hurt," stated Eleanor V, "but they helped us and it turned out to be pretty easy. Mr. Smith helped me and showed me what slopes I should start on. I went up on a chair lift with Jessica. We were only scared the first time on the lift. It was even more fun coming down." 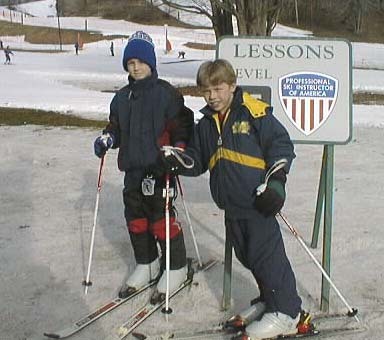 Chad M said, "This was my first time skiing. It was easier than I thought it would be. We started on the Bunny Hill for a couple of minutes until the workers thought we could move on. I went up on a chair lift. It was fast coming down. I was a little bit scared. I only fell thirteen times!" 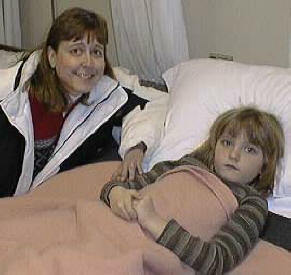 Sarah was brave. 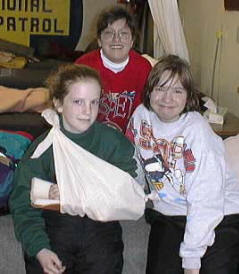 Her friends, Ashley and Erica, visited her at the First Aid Lodge. 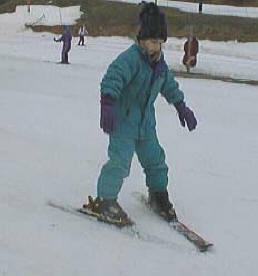 "This was my fifth time to go skiing," said Ashley B. "It would have been one of the best times except I got hurt. I hit a patch of ice and flipped. I didn't report it because it didn't hurt that bad. I'm glad I went." Sometimes even us tough skiers need a friend when we take a tumble! Brandon H. said, "Erica J. taught me how to turn better. Then I had better control and didn't go crashing. I really liked the day and hope I get to go again." 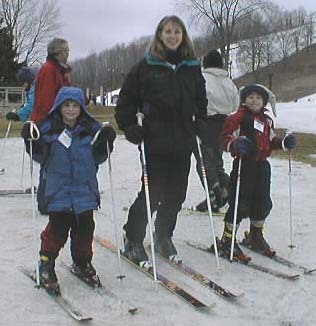 Most students worked hard at ski school. They learned a great deal. 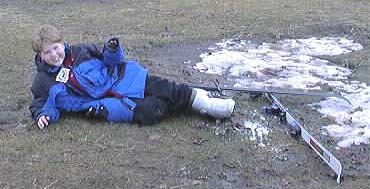 Some, however, couldn't remember the basics such as "stay in the snow area." We won't name any names, Dusty.